Coyote Moon is a 5 reel, 40 payline slot from the brains of the creative developers at International Game Technology (IGT) that has a theme set against the backdrop of the American wilderness. The first thing you notice when you start this slot is the similarity in visuals and imagery as other popular IGT slots including the wolf themed Wild Wolf and the landmark Wolf Run. 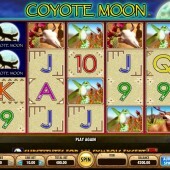 Coyote Moon has been treating players on land-based casino floors for years prior to its online release and it is easy to see why IGT were keen to transfer the slot onto the online platform. Fans of the land-based original will be familiar with the symbols in the game including a White-Tailed Deer, Hummingbird, Lizard and Cow Skull. The Howling Coyote Moon symbol acts as the Wild and this has the potential to turn into a Stacked Wild when multiple Wilds appear on the same reel. It also substitutes for all other symbols except for the scatter symbols to complete winning combinations. 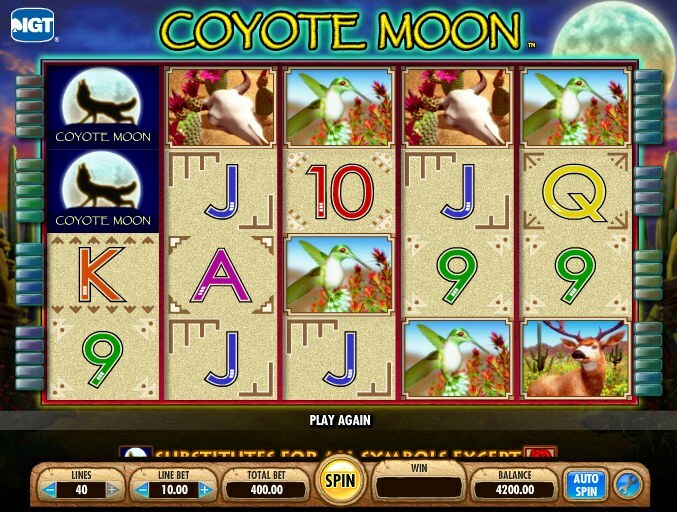 The Ancient Singing Coyote Bonus represents the Scatter symbol and if you hit three of these symbols across the reels then you will trigger the Rising Moon Free Spins Bonus feature. The scatter symbols only appear on reels 2, 3 and 4 so keep an eye out! The Rising Moon Free Spins Bonus feature is pretty easy to get to grips with. You are immediately awarded with 5 free spins and you also have the benefit of more Wild symbols being present on the reels increasing your chances of winning. The free spins can be re-triggered if you hit three scatter symbols on reels 2, 3 and 4 during the free spins. It is possible to re-trigger up to 255 free spins. Coyote Moon is seen as the less accomplished younger sibling of Wild Wolf and Wolf Run but that does not mean there is not a decent slot here. The bonus feature is fairly standard and will not transform the slots genre but you know what you are getting. There are big wins to be won but if you want a more riveting slots experience then there are better slots, even in IGT’s portfolio, that you will want to try.